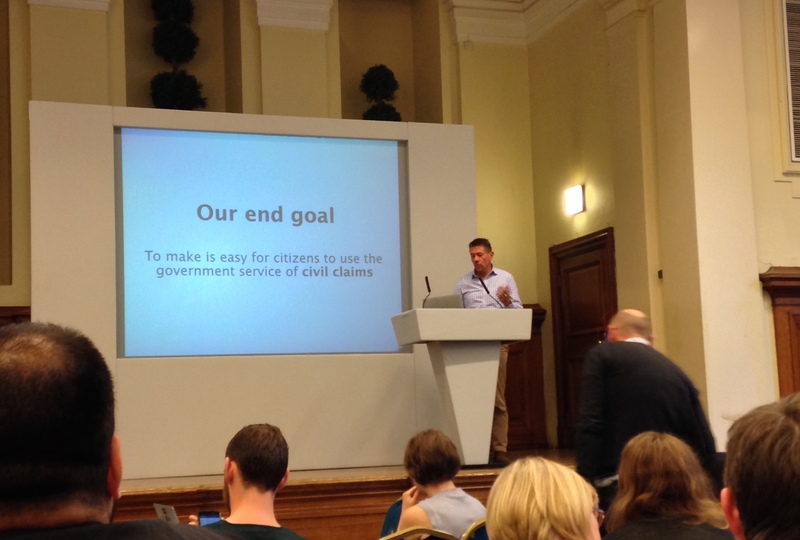 MOJ Digital gathered under the great domed roof of the Methodist Central Hall on Thursday for a big team pow wow. A true team effort made for a creative and enjoyable event. Our speakers Paul Shetler, Ursula Brennan, Matthew Coats, Andrew McGrath, plus 17 team presenters, seemed quite at home – perhaps not even knowing they were sharing a stage once graced by Gandhi, Martin Luther King, and Winston Churchill. First off, Paul Shetler (Chief Digital Officer) praised the team on getting 3 out of the 6 exemplar projects currently live across government. He reminded us all that redesigning public services was "not tinsel": "it’s more like a radical rethink of how things are done. A revolution in the true sense of the word." "Our mission is to improve people’s lives at a time when their lives are under great stress", he said. 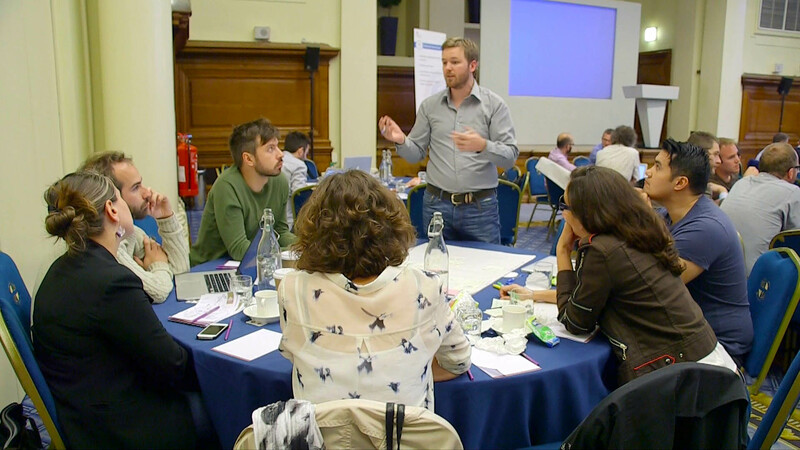 It's important to work ever closer with policy makers so our services are not built around the "dead hand of fossilised policy", but instead invite a proper rethink. By videolink, we then heard from Ursula Brennan, MOJ's Permanent Secretary. Ursula congratulated the team on the great work taking place. She reiterated the importance of digital in changing the lives of people who use the justice system, and told us how she was looking hard at what stops progress: procurement, problems with contracts, and getting the right staff. Matthew Coats, Director General of the Legal Aid Agency and Corporate Services Group, then gave thanks to the team for all that’s been done. 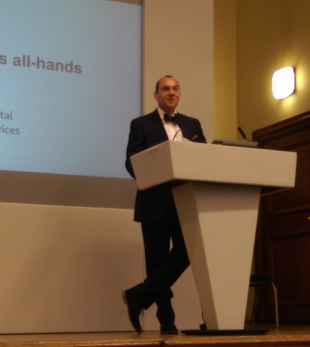 He said, "your focus on the user is outstanding, and it’s made a huge difference to front-line services." Matthew also mentioned Paul's outstanding vision and excellent leadership and talked about how important it is to work for a successful, well-run organisation. Promoting a great British tradition, Matthew suggested MOJ Digital invited colleagues from IT and other departments for a cup of tea, making the point that better connections will lead to better results for everyone. He also reminded us that he’s always up for a cuppa too! And perhaps more importantly, keen to hear any and all feedback. Onto the final speaker, Andrew McGrath, head of mobile User Experience (UX) at Thomson Reuters. Andrew made the point ‘mobile first’ is the way that all design gets done at Thomson Reuters. "If it looks OK on a phone or tablet, then it’ll look OK on a desktop too." "Users expect to be able to access your service across multiple devices. That’s basic. What you need to spend time understanding is their motivations for using different devices." He reminded us that it’s not always the best user experience to have full-service applications on mobile - using the iPad edition of Photoshop to illustrate his point. After the speakers, each of the teams made a 3 minute presentation, topped and tailed with the blast of an air horn. Stephen Richards, part of the Civil Claims team, picked up a bottle of champagne for the best presentation. Vera Mehta challenged the team to come up with a design for MOJ Digital’s birthday cake, celebrating 2 years for the team. The last item was a look at our responses to an all-staff survey led by Liz Citron. Turns out that the great majority of us are "very happy to work at MOJ Digital" and would "definitely recommend it" to others. Hurrah!